Live captions delivered anywhere, anytime, and accessed with ease. Recapd collects live captions during an event, call, meeting, or program and pushes them to the web in real-time right where you need them. Delivered to your browser, mobile device or embedded on your own site, Recapd makes captions accessible like never before. Need captions for your webcast, event, meeting or other purpose? Recapd is the simple solution. Scheduling an event is a snap. Share captions with your audience via a short URL, or copy/paste a snippet of code to embed the captions on your own page. Always mobile friendly. Continuous Feeds are an essential tool for broadcasters and others using live captions in volume who wish to harness their captions for web and mobile audiences, and create a searchable knowledge repository. 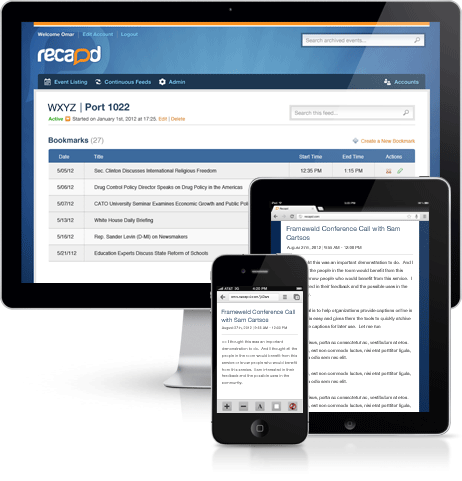 Using Recapd, you can archive, retrieve, export and search through countless hours of captions. Recapd provides a short, unique URL for your live event. Share the link with people who need access to your captions. The interface allows viewers to customize the text size, style and color; set the background color; and several other aspects of their experience. Your captions can be easily accessed on any mobile device using the Live Captions URL. Reach users on iPads, iPhones, Android and Blackberry devices, no matter where they are. The mobile interface is optimized for clear, clean caption delivery. Recapd makes placing live captions on your own pages as easy as copy/paste. Our widget delivers the same real-time captions, all of the user features, and is fully customizable to mesh perfectly with your site. 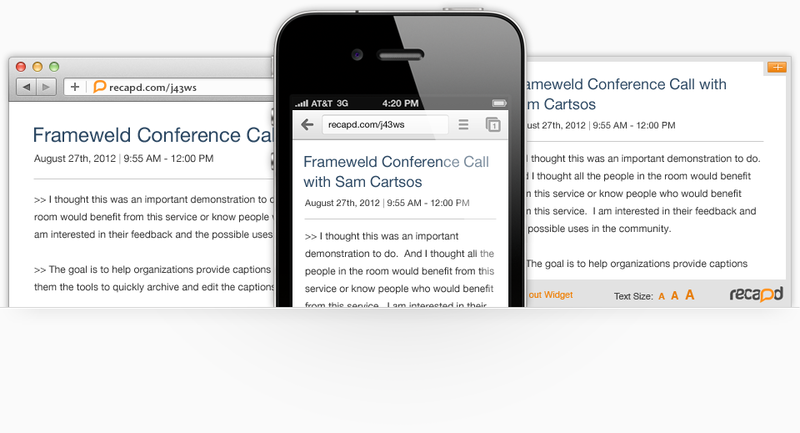 At the end of your event, get transcripts and caption files for immediate captioning of your archived media. Recapd gives you tools to trim and edit your captions, and shift timecode. You can search and filter through any amount of captions with timecoded and timestamped results.